Post Tuition Fees, from the Transactions menu, is used to post tuition fees to multiple families at once, also known as a batch. Use Post Tuition Fees to post fees for classes with either Billing Method, By Class Fee or By Total Hours. If you have classes with both Billing Methods, you will run Post Tuition fees twice as each method has separate settings and criteria options. Save your settings and criteria choices as a Favorite to save time and ensure consistency! This article will step through running Post Tuition Fees for classes billed By Total Hours. Use the tabs to work through the sections on the Post Tuition Fees page. For By Class Fee classes, refer to our Help article Post Tuition By Class Fee - Step Through the Process. Select By Total Hours to post tuition for classes with the Billing Method of By Total Hours. A link to view or edit your Fee Schedule will appear. When you opt to total the hours by Student you will have the option to add multi-student discounts (see below). When you post fees By Total Hours, you can only use one Billing Cycle. This field will default to the Billing Cycle you selected in your Total Hours Discount Settings (Tools > Edit Settings > Tuition Settings). When posting tuition, you can post to any monthly Billing Cycle within the next twelve (12) Billing Cycles or to any weekly Billing Cycle within the next fifteen (15) Billing Cycles, however, Post Tuition Fees must be run for one Billing Cycle at a time. This field will default to the start date of your next Billing Cycle; it is assumed that you have already posted fees for the current Billing Cycle. If you have not, use the Prev button to select the previous Billing Cycle. The Prev button is disabled when you have selected the current Billing Cycle. The tuition post date will default to the first day of the Billing Cycle selected, but it is an editable field and does not have any impact on your Billing Cycle start date. This is simply the date that you would like 'stamped' on the tuition fee transaction. For example, you may post tuition fees on the 15th of each month for the upcoming month. It's October and you are posting tuition for November - you would select the Billing Cycle start date 11/1/2018 and you would change the Tuition post date to 10/15/2018. 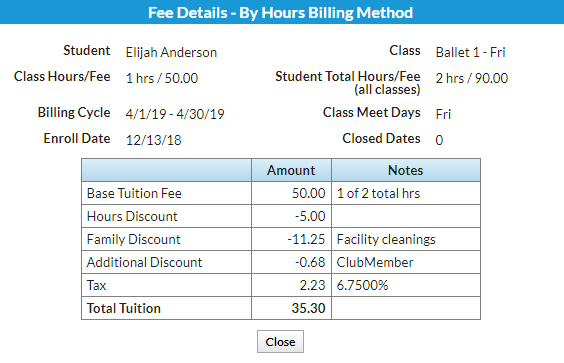 If you selected the Billing Method = By Total Hours, Jackrabbit will look for classes that match the Billing Method and the Billing Cycle you selected. If you include a Session, Jackrabbit will look for classes that match the Billing Method, the Billing Cycle, and the Session. Use the CTRL (Command on Mac) key to select multiple Sessions. Classes that match that criteria will be included in the tuition billing. If a class is missing any of the selected criteria, on the Summary tab of the Class record, it will NOT be included in the tuition billing. Use Edit All Classes to quickly locate and correct classes with missing information. To post tuition fees to all of the families in the classes you have selected, leave these fields blank. Use the following criteria to further filter the selected classes, so that only certain families in those classes are included in the batch. Select a specific family to post tuition fees to by searching their last name. If this family does not have a student currently enrolled in the selected classes, they will not be included; they will not appear in the preview of the batch. Select families from a specific Location to include in the batch. Use the CTRL (Command on Mac) key to select multiple Locations. Filter to only families with the Membership Type you select. The Membership Type is located on the Billing Info tab of the Family record. You can only select one Membership Type per batch. Filter to only families with the ePayment Schedule you select. The ePayment Schedule is located on the Billing Info tab of the Family record. You can only select one ePayment Schedule per batch. 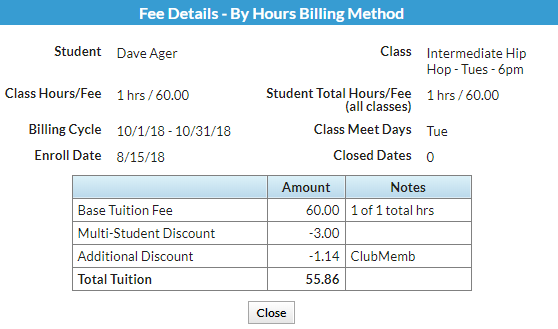 If you are using the Billing Method = By Total Hours and have set Post total hours by to Student, you can apply multi-student discounts to the tuition fees. The discount settings will default to what was entered in Tools > Edit Settings > Tuition Settings > Total Hours Discount Settings, but they are editable here, for just the batch you are currently creating. See our Help article Total Hours Discount Settings for explanations of these fields. There are a number of Additional Settings that can be selected when posting tuition fees. When selected, Jackrabbit will pull only classes with a Status = Active into the tuition batch. When selected, students who have an Enroll Type of Trial will be included in this tuition billing. When selected, students who have an Enroll Type of Waitlist will be included in this tuition billing. This does NOT include students who are currently on the Waitlist. It includes students who have been enrolled into a class from the Waitlist and who still have the Enroll Type set to Waitlist. When selected, Jackrabbit will prorate tuition for any student that has a future enrollment during the Billing Cycle. If you do not allow future enrollments (Tools > Edit Settings > Organization Defaults > Class Settings) this option will not display. Note: Future enroll dates are inclusive, i.e. the student is considered in class on that date. When selected, Jackrabbit will prorate tuition for any student that drops during the Billing Cycle. Note: The drop date is exclusive, i.e. the student is not considered in class on that date. If you have Tools > Edit Settings > Organization Defaults > Tax Settings > Tax Tuition Fees = Yes, you'll have the option to apply tax to the batch or not. The Transaction Type of Tuition Fee can not be changed. Optionally add a Transaction Subtype to the tuition fee posting. Transaction Subtypes can be created/edited from to Tools > Edit Settings > Drop-down Lists > Transaction Sub Types. Adding a customized note is optional. If a note is entered, it displays after the transaction note that is automatically created by Jackrabbit. The notes column is limited to 200 characters, so it is possible your notes could be cut off if too long. Define an Additional Discount to be applied to the tuition fees as well as your other discounting and/or prorating. What type of discount is this? If the Additional Discount is a dollar amount, it will be applied after all other discounts have been calculated and deducted from the base tuition amount (the tuition fee before discounting and prorating). If the Additional Discount is a percentage, and you prorate tuition, you will be given an option as to how to apply the percentage. See below. Enter the amount of the Additional Discount. How do you want to apply the additional discount? If you prorate your tuition fees. and you have selected a percentage discount, you can determine how the Additional Discount is calculated. After all other discounts have been applied - Jackrabbit will calculate the % discount after all other discounts have been calculated and deducted from the base tuition amount but before prorating has been calculated. After all other discounts and prorating have been applied - Jackrabbit will calculate the % discount after all other discounts and any applicable prorating have been applied. See our Help article Add an Additional Discount in Post Tuition Fees for an illustration of the differences between these options. Optionally add a label for the discount. If you want to use Duplicate fee detection, select the Use duplicate tuition fee detection check box and enter a date range that you would like to check for any possible duplicate fees. See our Help article Post Tuition Fees - Duplicate Fee Detection for full details on how this feature works. The Preview Tuition Fees page offers all of the details for how the discounts and prorating were calculated. Links are provided to the Family record, the Student record, and the Class record. Select the icon in the Details column to open the fee details. Let's look at the two families in the above image and go through a few of their fees. Per the Fee Schedule, one hour of class is $60. This is the base tuition fee for a one hour class. 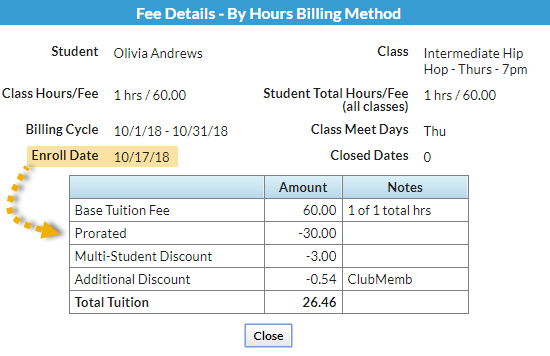 The total hours are by student and the additional discount and multi-student discounts are as shown in the screenshots in this article. This database is set to prorate tuition. Dani takes 2 one hour classes and the fee for two hours is $100 according to the Fee Schedule. The Hours Discount of $20 ( [$60 base rate per class x 2] - $100 ) is divided between her two classes at $10 each. The additional discount is $1, calculated as [$60 - $10] x 2%. Dave takes 1 one hour class with a base tuition fee of $60. He is considered the 2nd student in the family (he has the lower tuition) and is given a 5% discount of $3 [$60 x 5%]. The additional discount is $1.14, calculated as [$60 - $3] x 2%. Olivia takes 1 one hour class with a base tuition fee of $60. Because she enrolled halfway through the month she only attended 2 of the 4 classes and her tuition was prorated by 50%, or $30. With the lowest tuition, Olivia is considered the 3rd student in the family and is given a 5% discount of $3 ( [$60 - $30] x 5% )*. The 2% additional discount is calculated as [$60 - $30 - $3] x 2%. *The prorating options in this database do not prorate discounts when tuition is prorated. 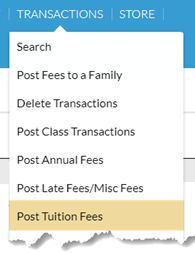 When you have reviewed the tuition fees in the preview and are happy that everything is as it should be, use the Post Fees button to post the transactions to the family accounts. 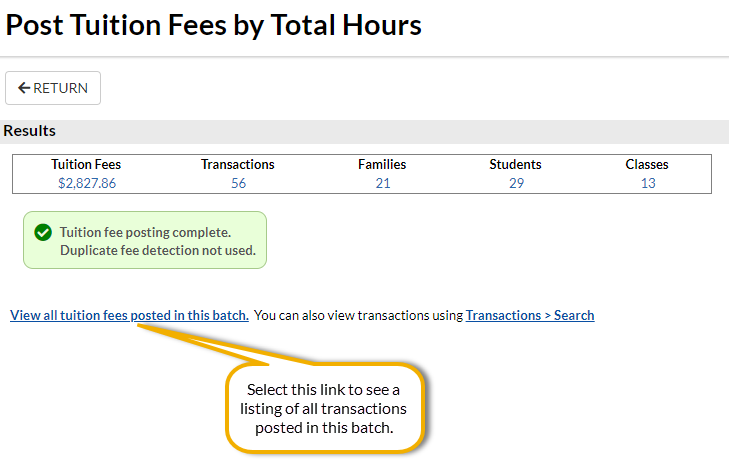 If you post a tuition batch in error, use Delete Tuition Fees, from the Transactions menu, to delete them.